I spent hours while Andie was napping going through all of the Tiny Prints designs - and it's so hard to pick just one! Thank you to Veronica from Nica Photography for releasing these pics for us to use! I am in love with Tiny Prints and all of their birth announcements. They make the best stuff. So which one did you end up going with? Can't wait to see you and meet her this weekend! #1 is so perfect and simple! It is my favorite! BUT They are all wonderful, because she is so darn cuuute! Love!! Can't wait to order mine in a few months! Love the first one! I'm a sucker for pendant banners! Those are all precious! I had a hard time picking out my graduation announcements from Tiny Prints because they're all so dang cute! LOVE them all! Andie is just gorgeous! You have to just pick ONE? Good luck with that..it's impossible. :) She is just as sweet as can be! the first and fourth are my favorite! So cute! Love the first one! I love them all!! But my favorites are the first and second. So cute! I love the first one! Where did you get the gray headband she's wearing in her pics?! adorable! Love them all, but the first and second are so unique and beautiful! All so perfect, just like precious Andie!! Those pictures are so beautiful!! I love them! So many adorable pictures and layouts to choose from! They are all so wonderful... Good luck with your choice Tracy! AbsolutelyPaper.com is easy to use! 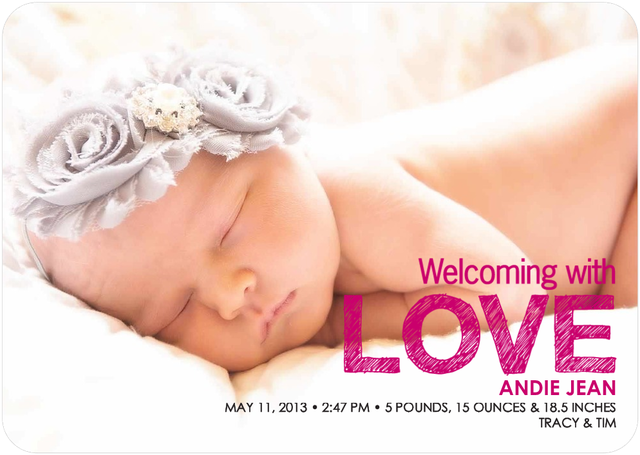 Search our hand-picked selection of unique Birth Announcements from the best designers and choose the style you like best. Then customize it and you’re done. Browse through the website for Tips & Etiquette for guidance in creating your card. A letter to Andie: You're One Month Old!